ARCHANGELS is a company based in God's Country (beautiful sunny Southern California), dealing in Rare and Unique Paper Collectibles. We specialize in vintage Comic Books, Original Comic Book Artwork, Hollywood Movie Posters and other related items as well. We are Senior Advisors to the Overstreet Comic Book Price Guide and a Charter Member Dealer with the Comics Guaranty, LLC (CGC). For other wonderful items, make sure to visit us at our About Me Page. Fantastic Four #250 Art by John Byrne. Spectacular battle page for Fantastic Four #250 (Marvel Comics, 1983 - Large Anniversary issue) by non other than the titan talent of John Byrne himself (pencils and inks). 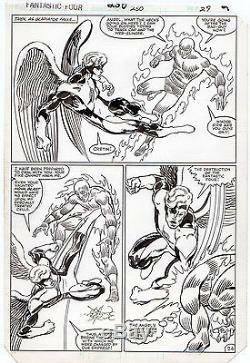 This pulse pounding page 24 depicts the Human Torch going toe-to-toe with the Angel (Skrull impostor) in full out melee for the story, X-Factor! Piece features three large panels and highlighted by the first panel being a near half splash. Absolutely beautiful figure work and dynamic action that perfectly represents Byrne's remarkable work in his peak prime period. Top notch marquee pages from Byrne's classic FF run such as this one are extremely difficult to find now and becoming more and more rare in the marketplace. Beyond any doubt, this page is one of the very best Byrne pieces we have ever seen anywhere and at any time. Art is in excellent condition with image size measuring 10 x 15. The item "Fantastic Four #250 Art by John Byrne" is in sale since Wednesday, June 10, 2015. This item is in the category "Collectibles\Comics\Original Comic Art\Interior Pages". The seller is "water-walker" and is located in San Diego, California. This item can be shipped worldwide.